Nabta astronomical stone circle and megaliths discovered and radiocarbon dated by scientists in 1998 to be at least 6,500 years old, the oldest known astronomical alignment of megaliths in the world. Some of the stone slabs are nine feet high and originated miles away from the constructed circle. Photograph courtesy Professors J. M. Malville, Univ. of Colorado, and F. Wendorf, Southern Methodist University. 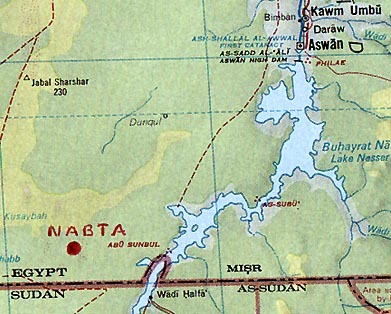 Nabta astronomical stone circle and megaliths are 100 kilometers (62 miles) west of Abu Simbel (Sunbul) in southern Egypt's Sahara Desert far west of the Nile River. November 2, 2002 Albany, N.Y. - Four years ago in 1998, a team of scientists lead by Fred Wendorf, Ph.D., Anthropology Professor at Southern Methodist University, reported in the science journal, Nature, about the oldest known astronomical stone circle on earth. 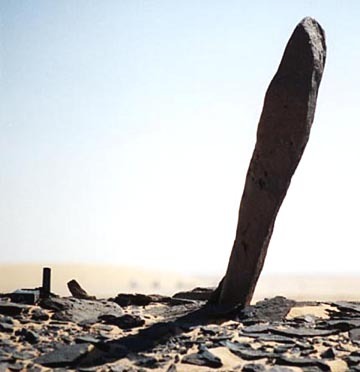 The stone circle is associated with a series of flat, carved stone structures, six lines of standing and toppled megaliths and two buried megalithic sculptures in southern Egypt's Nabta Playa 100 kilometers (62 miles) west of Abu Simbel. Radiocarbon dating indicated the structures were in 4,500 B. C. sedimentary layers, at least a thousand years older than Stonehenge in England. Nabta Playa is rich in prehistoric remains of the early Holocene age when there was rain and a lake, but no skeletal human remains have ever been found.